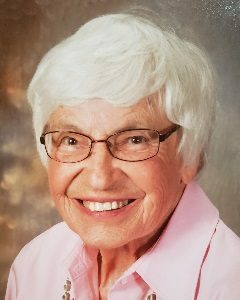 Helen Milbrand, age 93, of Glencoe, Minnesota, passed away Friday, February 1, 2019, at Ebenezer Bel Rae Senior Living in Mounds View, Minnesota. Memorial Service will be held Saturday, February 16, 2019, 1:00 P.M. at St. John’s Evangelical Lutheran Church in Helen Township, rural Glencoe, Minnesota, with interment at a later date in the church cemetery. Gathering of Family & Friends will be held Saturday, February 16, 2019, from 12:00-1:00 P.M. at St. John’s Evangelical Lutheran Church in Helen Township, rural Glencoe, Minnesota. Helen (Najmon) Milbrand was born on August 29, 1925, in Pine County, Pine City, Minnesota. She was the daughter of Frank and Anna (Novak) Najmon. In 1960, Helen was baptized and confirmed in her faith as an adult at St. John’s Evangelical Lutheran Church in Helen Township, rural Glencoe, Minnesota. She received her education thru the 8th grade at Sauter Country School in Pine City, Minnesota. On December 21, 1959, Helen was united in marriage to Verlin Milbrand at the Little Brown Church in the Vale in Nashua, Iowa. Helen and Verlin made their home in Glencoe, Minnesota. They shared over 46 years of marriage, until Verlin passed away on October 2, 2006. In addition to being a loving wife and homemaker, Helen helped Verlin on the farm until 2006 when they retired. Helen was a faithful member at St. John’s Evangelical Lutheran Church in Glencoe. She enjoyed reading, gardening and plants. Helen loved the time spent with family and friends. Helen passed away on Friday, February 1, 2019, at the Ebenezer Bel Rae Senior Living in Mounds View, Minnesota, at the age of 93 years, 5months and 3 days. Blessed be her memory. Helen is preceded in death by her Parents, Frank and Anna Najmon; Husband, Verlin Milbrand; Brothers, Frank Najmon and his wife, Nora, Joseph Najmon, Charlie Najmon and his wife, Violet, Emil Najmon and his wife, Betty, Rynold Najmon, Richard Najmon and his wife, Arlene; Nephew, Gerhart Najmon and his wife, Cheryl.